How should I measure social engagement? When you consider the activity customers make to interact with your brand, it helps to have a framework to measure the result. One helpful way to do this is to consider the Amplification and Applause that you get from the items you post. What is Social Amplification Engagement in Rival IQ? Amplification is the action where your followers share your content - we track when someone amplifies your message by retweeting a Post on Twitter, sharing a post on Facebook, or sharing a post on Google+. Amplification is important because when a company's followers retweet or share that company's content a much wider audience sees that content (against a potential reach of all of your followers multiplied by their followers). There's an important note here as well - on Facebook we track the retweets, shares, and posts on the original post only, not on "shares of shares". For example, if someone shares a post from the Rival IQ Facebook page on their own timeline, and then a second person re-shares this post starting from their own timeline, we don't capture the secondary share metrics. What is Applause Engagement in Rival IQ? Applause is the action where a follower tells you what content they prefer by "liking" or "favoriting" content. We define "Applause" as what happens in Twitter when you "Favorite" a Tweet, in Facebook when you "Like" a post or photo, in Google+ when you add a "+1" to posts, in YouTube when you "like" a video, or in Instagram when you "like" a photo. Tracking Applause will highlight content your audience identifies with strongly. What is Amplification Engagement in Rival IQ? Amplification is the action where you share content. We define "Amplification" as what happens in Twitter when you "Retweet" a Tweet, in Facebook when you "Share" a post or photo, and Google+ when you "Share" a post. 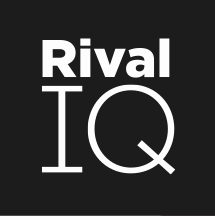 What is Conversation Engagement in Rival IQ? Conversation is the action where a user or follower comments on your content including post comments on Facebook, LinkedIn, Google+, YouTube, and Instagram. Note: Conversation does not include Twitter Replies because Twitter does not make the reply counts on tweets available in their public API. This is a great summary of social media metrics covering conversation, amplification, and applause here.